There are seven things to look for when choosing a wedding photographer: style, quality, personality, communication, service, products and price. Find someone that fits with what you want using these seven criteria and you will be happy with your experience, your photographer, and your wedding photographs. Style is the most important criteria in my mind. Let me explain what I mean by style. It is not only the type of photographer you are looking at (classical, contemporary, photojournalistic, documentary, or fusion would be terms associated with a style), but also the particular way that a photographer sees and creates images that is unique to that person. When you are looking at the work of a particular photographer, think about what type of images you want to end up with. Do you want candid, natural expressions or images posed to perfection? Do you want classic, formal images or free-flowing contemporary images? Do you want someone there to document the events or to set up images during the events? Do you want a mix? There is no right or wrong way to photograph a wedding. There are definitely some I prefer to others, but I don’t begrudge others their choice. If you know what you want, it will be much easier to choose a photographer that naturally fits your needs. The second part of style that I alluded to earlier is an individual style for the photographer. If you are looking at 10 different albums from 10 different photographers, could you make a guess as to which came from an individual photographer? This is a personal style. Images that are recognizable as coming from the unique vision of a particular photographer. I expect a lot in the way of quality of photography. Someone that takes pride in his or her work won’t be satisfied with mediocre. Quality photography means a lot of things to me. Black and white images should be crisp with a complete range of tones from complete black to complete white. They should be neutral of color without a color shift to magenta or cyan (common lab processing error). Color images should also have a good range of tonality from light to dark. They should also have skin tones that look natural to the subject. The ambient lighting in the venue should be retained at least in part so that a feel of the place can be viewed in the image. When flash is used, it should not overpower the scene to the point the background of the images are lost to blackness. There should also not be sharp shadows behind the subject from the overuse of a direct flashgun. These have all been technical issues that I’ve talked about. There is also the quality of art that a photographer produces. Are you moved by the images that the photographer produces? Do his or her images speak to you about the experiences of the day? After you look at one album, do all the others just look the same and boring? Does your significant other keep looking at their watch when you try to show this photographer’s website? Do you feel the experience of the bride and groom in the albums? Does it make feel like crying? Would you frame his or her work for your wall just because you love the photograph even if it wasn’t of you? Some of these things will help you figure out how a particular photographers art works for you. A good way to judge quality is to view the albums the photographer presents and a complete wedding (proofs, proof books or online) so that you can see the images that are delivered, but not put into the photographers “All Star” wedding sample album. 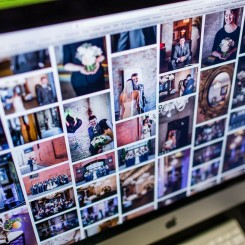 An easily overlooked aspect of choosing a wedding photographer is their personality. This is a person that is going to be around your family and friends all day at your wedding. The way they behave and interact with your guests will partially shape how your wedding is remembered. Do you want the director type personality that will tell you what they think is the proper way to do things? Someone that sits back and doesn’t talk at all? Someone that is pleasant and easy to talk to? Choosing a personality can be difficult because you only know them for a short time. Look at some of the quotes they use in their marketing. Are they all about how great the images are, or do some of them also talk about how great the photographer was to work with? Also, if you are considering a studio with more than one photographer, you should meet with the photographer that will shoot your wedding. How can you be a judge of a person’s personality if you never meet them? Do you trust the studio enough to send someone out that will be hanging out with you on your wedding day? Choosing the right person can make your wedding day more relaxing, enjoyable and fun. It can also make working with that person to create an album a lot more enjoyable. People just communicate differently. With some people, you know exactly what they mean when they say something. Other times…not so much. Your photographer should be able to answer all your questions in a way that you feel like you were actually answered. They should listen to what you have to say and you should feel like your thoughts are valued. The photographer should be able to explain exactly what is included with your package in a way that does not leave any questions. You are not a photographer and should not be expected to know every photographic product on the market or how they compare to the photographers other offerings. They are the experts on their own products! If they are able to communicate these things well to you, you should be able to work well with them after the wedding to get your albums and other products and your family should be in good hands if they contact the photographer. A lot of times photographers are independent owner-operators. This leads to some challenges for both the clients and the photographer. An independent, one-man or one-woman shop physically cannot answer the phone every time it rings or return every email within an hour. However, when you do reach them, you are talking to the owner and operator. Large studios offer the opposite. Someone will pretty much always answer your phone call or email in just a few minutes. However, that person may not be the person you wanted to talk to. You should expect to be able to hear from the person you wish to speak with within one business day. You should also ask about business hours. Do they normally have availability to meet when you are available as well? Also, ask when your photographs will be done after your wedding. The range can be huge. From three days to three months. Other ways photographers provide excellent service is by clearly explaining the album design process, being pleasant to work with, welcoming your input on improvement and staying in touch both before and after the wedding. Does the photographer provide the type of products you desire? Some photographers hand over the negatives and files and are done. Others will create guest books from your engagement session, albums from your wedding, slideshows from either one, web viewing, or even blankets or jewelry. Which of these is important to you? If they don’t provide you with what you want, do they provide you with the resources to get it done by someone else? Or will they go out of their way to create it for you even if they don’t normally offer it. I think the photography is more important than the product, but having the final product that fits what your desires is definitely important as well. The final piece of choosing a photographer is price. In many ways this is the least important criterion. However, buying a brand new BMW when your budget is for a 10 year old Hyundai may not be the smartest financial move you will ever make. To use a classic wedding photographers marketing cliché, when all is said and done at your wedding, the flowers, food, drink and cake will be gone, the band will be a memory. 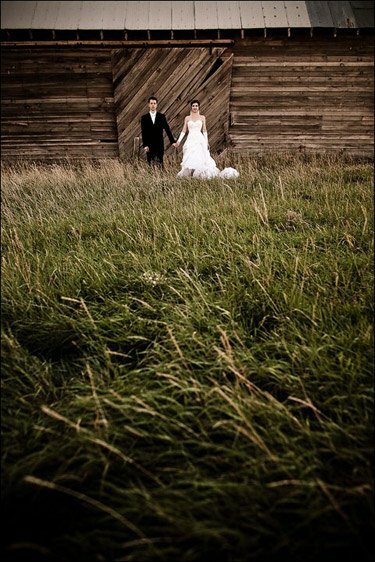 What you will be left with is your wedding photographs. If you look at those wedding photographs and you are transported back to the feelings of excitement, joy and bliss of those moments when you look at them, can you really put a monetary value on that? Photographers vary in price from around $1500 at the bottom end to around $50,000 (that is NOT a typo) at the top end. 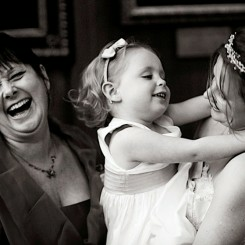 The value a particular wedding photographer has to you is completely personal. Someone that can create images in a style that makes you tear up when you look at a wedding that is not yours is much more valuable than someone that can take okay photographs. Add on the quality, personality, communication, service and products that you want and then judge their price. Good luck with finding a photographer for your wedding!